I had been to C5 in 2012 as part of a wider West Africa trip and returned in 2014. Strictly speaking C5 had dropped out of the Commonwealth but the DXCC still counts for BERU. I have just activated AF-060 Bijol island 3 miles off the coast and went from there straight to the key (100% beach operation using batteries). 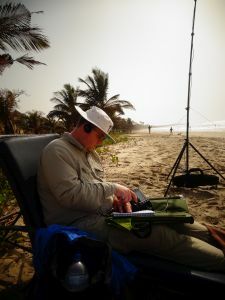 The qth was the beach near Brufu 10 miles or so South of the main hotel strip just above Tanji Bird Reserve and almost without the local noise that now plagues operations from the original Radio Syd location around to the African Village. Electric fences, PV solar and mobile phone set ups all adding to the once silent noise floor. The difference was notable in just two years. The Gambia is a pretty cheap easy place to get to and the pile ups that greet you will be lots of fun. 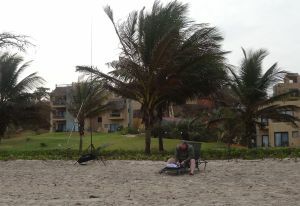 I managed to work most places on the globe qrp from there, nothing fancy KX3, motor bike battery and a buddipole from the beach. I am a slow cw op so the speed of some ops didn’t help me… Yes I know I need to improve but why if took several exchanges to get my call/your call right do ops then give me a serial number once followed by tu at 30wpm and then evaporate. I will only delete the qso. I gave up as it stopped being any fun and I went to WARC bands instead. I had planned the trip to be in BERU so this was very disappointing. Licencing is pretty easy but payment for it (1,000 dalasi about £20) is a bit more complex as to pay the Gambian Revenue Authority requires a Gambian Tax Payers Identification Number. Thanks Bob for the post. For info for others the hotel in the last image behind me is the Sheraton and the security guys (station out of picture to the left are on the beach all night long) they were great and looked after me which you will need as you really do not want to be on a west african beach by yourself at night. No hotel operating two reasons… mains was lethal, earth floated at 110V and they stated operating from any room caused interference… but not from the beach!